(SALEM, OR) When founded in 2009, the humble goal of St. Louis-based GateKeepers Roller Derby was to merely be competitive within the rapidly-growing men’s flat-track sport that’s contested on quad skates. 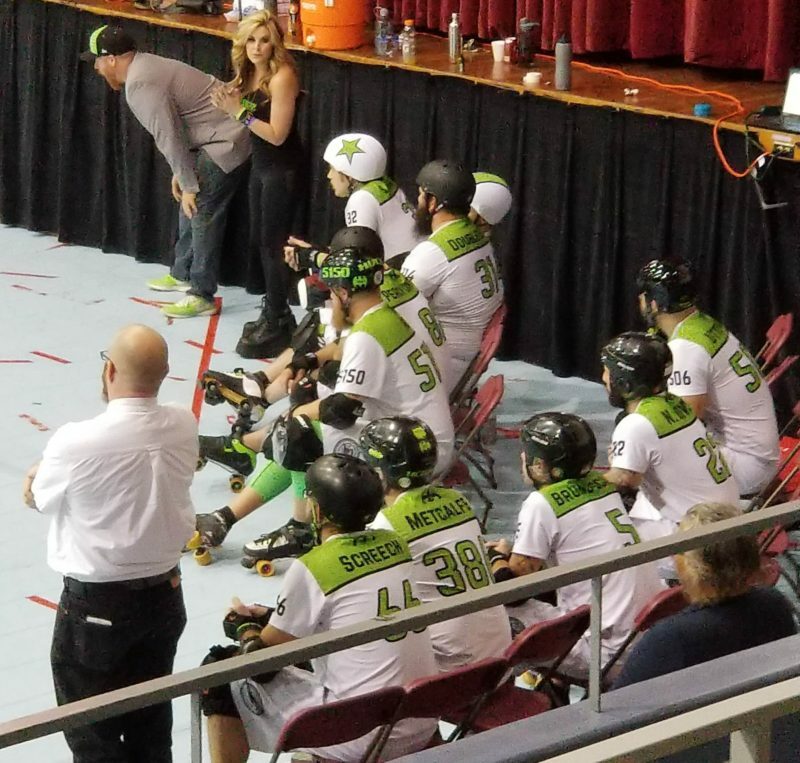 With their weekend results at the Men’s Roller Derby Association international finale, they are now considered the preeminent franchise as they claimed their fourth consecutive championship. In the three-day, twelve-team bracketed tournament held at the Salem Armory, the top-seeded GateKeepers topped the Bridgetown Menace on Sunday, 162-150, to record the “four-peat” and finish the season undefeated (12-0). Combined with Friday’s quarterfinal win over Magic City (211-137) and Saturday’s semifinal triumph over Roller Derby Toulouse (230-71), GKRD extended their MRDA-sanctioned winning streak to 44 games. The squad claimed their first international title in October 2015. 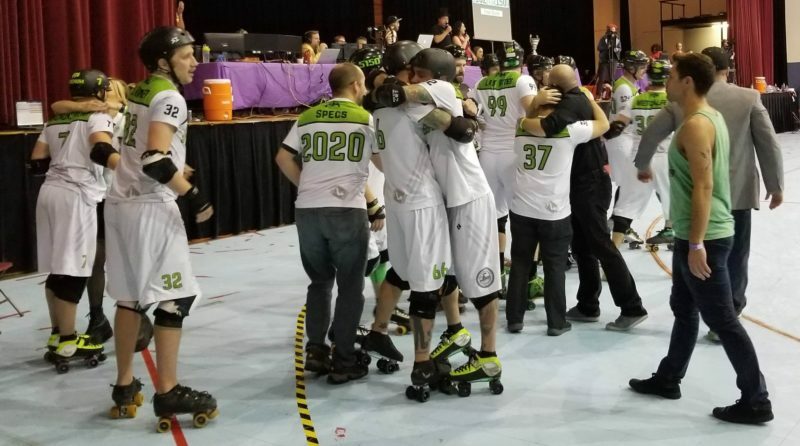 The “four-peat” notched by the Gateway City rollers breaks the trophy tie shared with Des Moines, Iowa-based Your Mom Men’s Roller Derby, who had also possessed three consecutive championship wins (2012-14). As projected, the heat was certainly felt in the trophy game against the second-seeded Portland-based faction that had pushed St. Louis to the limit at the 2017 finale and sought their first-ever title at an in-state venue. That vision became crystal clear from the onset as the Menace pounced early. Following a scoreless game-opening rotation, Bridgetown jammer Sausarge netted lead in Jam 2 and with the help of blockers Miller, D. Botts, Luce Wheel and Optimus Quad, churned a 17-point strike that resulted in an early boast. St. Louis chipped away with nine straight over two rotations and reduced the deficit to 17-9. Menace jammer Tofer Griffin collected three in Jam 5 that pushed the score to 20-9 six minutes deep. The GateKeepers then went on a 24-0 run over the next five jams that resulted in a scoreboard flip. Following Screech’s four-point strike and a two-pointer by Metcalfe in Jam 7, co-captain Magnum P.I.M.P. snatched a five-point power jam with 21:10 left in the period that tied the score 20-20. Shane Bower notched four with 20 minutes left handed St. Louis the lead, 24-20. Screech finished the rally with a nine-point power jam that pushed the score to 33-20. Bridgetown recovered and went on a 21-0 rally over the next four jams that flipped the script. Highlighted by Sausarge’s 8-point power jam at the 15:15 mark and back-to-back grand slams from Freak Style and Austin, the Menace possessed a 41-33 lead with 12:45 left in the period. The GateKeepers’ blocking schema of Percy Control, Hulk, Spin Diesel, The Saint, Double Excel, Bled Zepplin, Kyle Stark, Nate Bower and Sir Nix-A-Lot, helped net three consecutive lead jams that resulted in a 14-3 run and a lead of 47-44 with ten minutes left in the half. The topsy-turvy complexion of lead changes continued as the period progressed and St. Louis held a 58-55 lead with under five minutes remaining in the frame. St. Louis jammer Last Rites’ 12-7 rotation went a full two-minute rotation that pushed the score to 70-62 and Bower followed with a four-pointer that extended the lead to 74-62. Bridgetown’s nine-point rally in the last two rotations yielded four and five points for Griffin and Austin, respectively, and when the final whistle blew that concluded the period, St. Louis maintained a slim, three-point lead, 74-71. The Menace successfully carried over the momentum that was achieved prior to the break and with the help of blockers Tommy Gun and Jamerican Psycho, Griffin netted nine on the opening rotation that resulted in an 80-74 scoreboard flip in favor of Portland. Not to be outdone, the GateKeepers retaliated with a baker’s dozen uncontested and with Magnum’s four-point power jam collected at the 23:25 mark, St. Louis held an 87-80 advantage. Over the next several minutes, the teams engaged in a battle that could be best considered comparable to a heavyweight prize fight. When the smoke had settled, and after Bower hit a ten-pointer with 16:50 left, St. Louis had stretched the score to 110-92. To add insult to injury, Magnum added a dozen with 15:40 left that extended the lead to 122-92 and Screech recorded a grand slam that resulted in a 127-92 game. Bridgetown refused to back down and gained a power jam with 14 minutes left that resulted in a 19-point collection from Sausarge that whittled the score to 127-111. St. Louis then proceeded to adapt a winning wear down that resulted in claiming lead in the next six rotations. This resulted in a 16-0 run that was concluded by Magnum’s five-pointer that made the score 148-111 under eight minutes left. That seemed to be a comfortable lead, right? Think again! Trailing 158-126 heading into the game’s final jam, Bridgetown’s Freak Style barreled his way into the front of the pack and claimed lead jammer status. After two scoring passes that yielded ten points, GKRD’s Magnum was whistled for an infraction that resulted in a power jam for the Menace. After making a third scoring pass that whittled the score to 158-141, Style was called for a penalty that sent him to the box. As the period clock expired, Magnum re-entered the track and attempted to post points as the jam clock whittled away. As the jam clock approached the twenty second mark, Style went back into play and feverously attempted to collect as many points as possible. When the final whistle blew, Style had outscored St. Louis 24-4 in the rotation, but the deficit experienced could not result in the come-from-behind win as the GateKeepers survived the 162-150 nail biter. St. Louis outscored the Menace, 88-79, in the second period. Magnum unofficially topped GateKeeper scoring with 59 points followed by Bower’s 38. Sausarge paced the Menace with 58 points. Most importantly for GKRD, the magic number achieved on Sunday was “4” and one can bet that there are plans already in place to extend that winning streak. 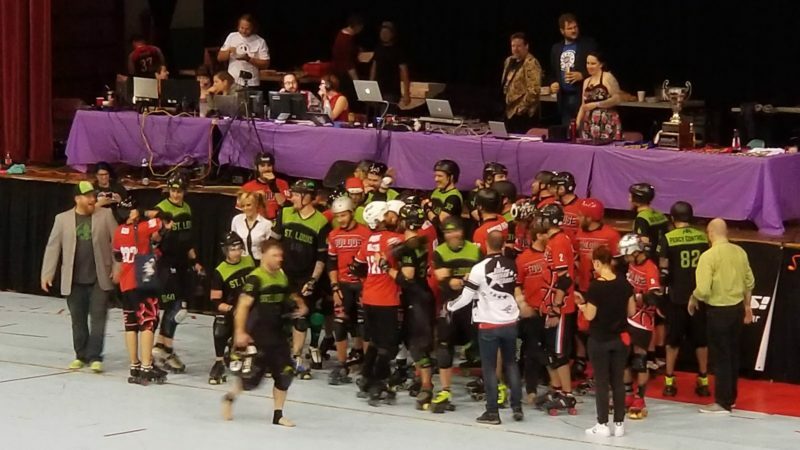 In the bronze medal game that preceded the finale, Roller Derby Toulouse from France won their inaugural medal with a dominant 374-118 victory over the Vancouver Murder. Toulouse, who came into the tourney seeded fourth, quickly snared huge lead with Vass Lemenance’s 20-point power jam in the second rotation. This launched a plethora of lead jams that resulted in an 81-1 advantage ten minutes in. Toulouse (3-1) held a 171-51 lead at intermission and maintained the momentum in the second period and pushed the lead to 300-95 following Lemenance’s 24-point strike with nine minutes remaining. 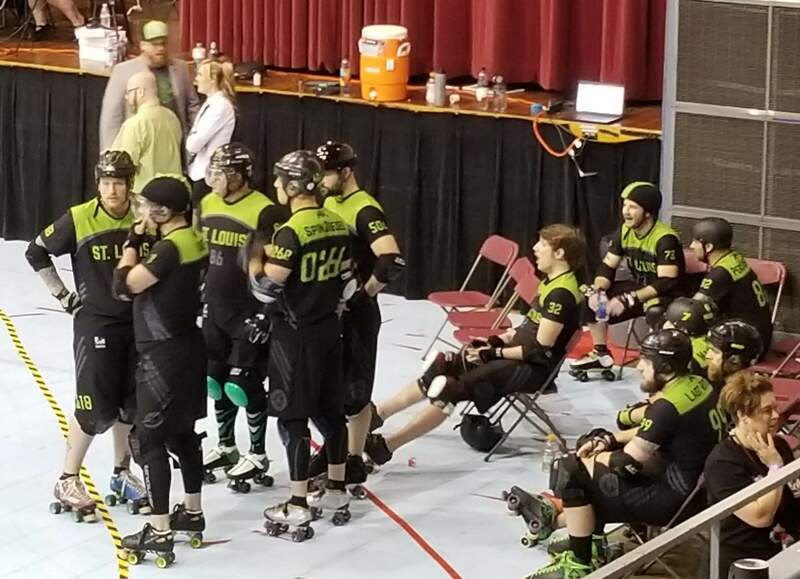 The Quad Squads outscored Vancouver in the second period, 203-67, en route to the triumph, which marked the first-time in MRDA history that a non- North American League had claimed a medal at a post-season tournament.